1. How could this happen when it is so popular, with both tourists and locals? 2. ANOTHER property development? How could they be so short-sighted? And then, 3. How could they do this to me? Because, as much as other street food places have (and soon will) find themselves homeless in the path of the powerful god of gentrification (see: Bamee Rungrueang on Sukhumvit 26; Tang Meng Noodle near Sukhumvit 49), this is the first one to really hit home. Where else will the mango sticky rice ladies greet me, where I can bump into my parents on the way to the egg noodle vendor, where the Thai dessert stall ladies can completely ignore me? Where else will I be able to find a complete street food ecosystem — organically grown, spontaneously grouped, and dare I say “authentic” — a mere 5-minute motorcycle taxi ride away? Thai street food has become a home for me in a lot of different ways. It’s given me plenty of fodder to write about; it’s nourished me with food that has been occasionally mind-blowing; it’s taught me a lot about how Thais live and interact with each other. It’s also provided me with a sort of community where I feel welcomed and included — Sukhumvit 38 was a part of that. And, yes, the fiery woks, sweating, beanie-clad cooks, plastic chairs and tables wreathed in steam from a just-cooked bowl of noodles, sidewalks grimed in picturesque squalor, all of this served as a reminder that I was indeed in Thailand, and that it felt like nowhere else on earth. For me, Thailand is all about this sense of spontaneity, of possibility and anything waiting for you just around the corner — even maybe the best meal you’ve had yet. 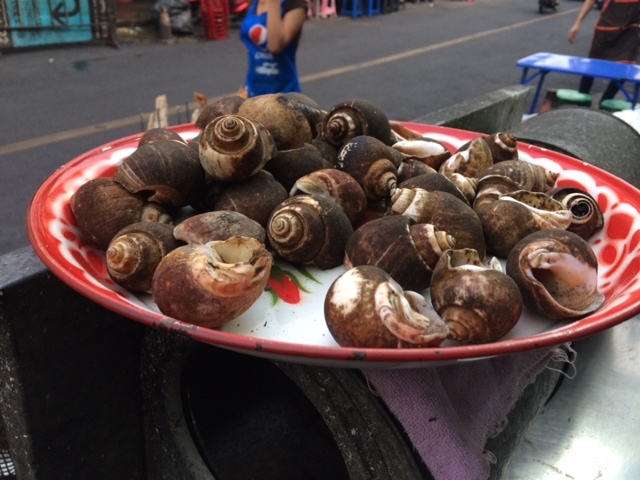 But Thailand is changing, and street food with it. Some of Sukhumvit 38’s vendors will sink into retirement, and some will find new homes, probably in a food court at one of the city’s inexhaustible supply of new malls. That would be a shame, because as nice as it is to sit in air-conditioning for a while, the food somehow seems nowhere near as good. It’s funny, really: having said repeatedly that “it’s all about the food”, I find myself realizing that the secret ingredient in a lot of the stuff I sample is sitting streetside or in the shophouse, hobbled by inconveniences, surrounded by strangers. Sitting with everything laid out for me on a tray, utensils helpfully provided, makes the food seem picayune in comparison, something to fill my stomach until I have something better to do. The food is no longer the destination. To think that this is probably the future for Thai street food makes me want to stick my head in a vat of McDonald’s french fries. Yet Bangkok is still full of streets just like mine, where a curry rice lady shares space with a noodle guy just down the road from my house. I only need to walk a few steps to get an old-fashioned cup of Thai iced coffee from a woman who has been there for the last 50 years, and the ice cream guy and Isaan sausage guy go past my house in the afternoons. Only a couple of months ago, I opened the door to find that a made-to-order vendor had set up shop right next to me. Street food as I know it is still around. I’m going to make sure to try the made-to-order guy the next time I see him.